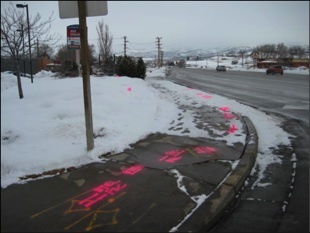 SUE Solutions successfully completed the Quality Level ‘B’ utility designating, survey, and mapping services for the Heber City Interconnect project located in Heber City, Utah, for UDOT Region 3. As part of this one and a half mile project, UDOT plans to install a fiber optic cabling system to interconnect the existing five signalized intersections within this project. SUE Solutions contracted with UDOT utilizing the On-Call contract in place between SUE Solutions and UDOT. SUE Solutions was able mobilize their technicians onto the project within two weeks of the initial contact made by UDOT. This quick response was critical to the project, as UDOT’s goal is to have the project completed prior to a local roadway project which is to begin a few months later. SUE Solutions located over 30,000 feet of utilities which included culinary water, phone, CATV, fiber optics, power, natural gas, and storm drain and irrigation facilities. SUE Solutions was able to locate these utilities ahead of schedule and under budget, despite heavy snow, ice, and wintertime conditions. 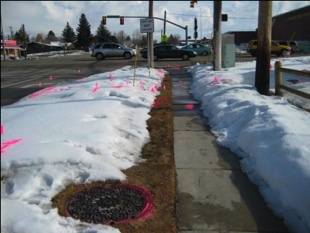 The final deliverable to UDOT included a comprehensive final report making note of existing conditions and limitations, QL-B mapping, project photographs and description of the utilities located, storm drain and irrigation data sheets, and Utility Owner mapping, survey data, and a Microstation utility design file.